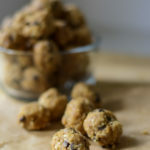 Peanut butter protein balls are a great lunch snack. A cross between cookie dough and a power bar–how can you go wrong? We have been packing a few of these in our lunch bags all week for a perfect sweet treat in just the right size. On a personal note, I have been furloughed as a federal employee for the past few weeks. I am struggling a bit with what to do with my time. I always think that if I didn’t have to go to work—I would spend all of my time on my blog. Yet, here I am, not going to work and I still manage to fill my day with so many other things. Today, and the rest of this week, I am going to be recipe testing (and possibly even video making). I need to take advantage of this time! My goal is to post at least once a day for the rest of this government shutdown. A cross between cookie dough and a power bar makes a great lunch snack. Vegan and gluten free! In a food processor, combine all ingredients (except chocolate chips), process until well combined. Using a small cookie scoop, form balls and place on baking sheet. Refrigerate for 1 hour and then enjoy! They keep well in the refrigerator for about a week if you keep them covered. 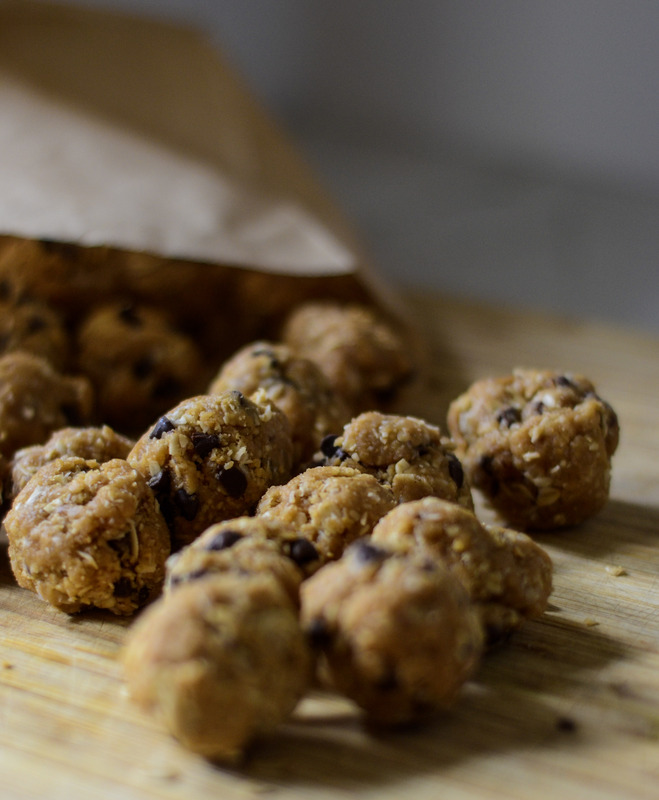 A cross between cookie dough and a power bar equals a perfect lunch time snack.